We have developed a world economy that is increasingly dependent on our information and communication technologies, says former NATO head Anders Fogh Rasmussen. That's why the crux of our future welfare depends on the development of advanced cybersecurity. For the longest time we've heard tell that the major battles to determine the outcomes of future wars won't be fought on physical battlefields but rather by hacker combatants in cyberspace. 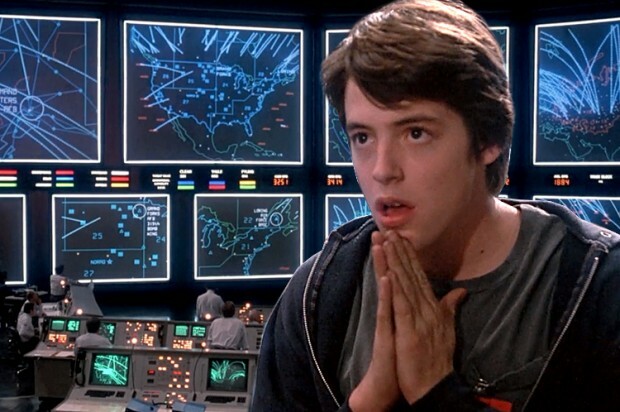 And while the future Ferris Bueller learned first hand the dangers associated with computer war, the broader, non-Matthew Broderick public has yet to come into contact with full scale cyberwarfare. Now that's not to say these cyberwars haven't already been happening -- there's compelling evidence to support that they have -- but it's important to note that this is not war as we know it. It's also likely not the kind of war we were expecting. BBC technology reporter Dave Lee does a fantastic job exploring this issue in a terrific piece that went up yesterday. The crux of his article revolves around the innate challenges of reporting a conflict you can't see. It's this concept of invisibility -- that cyberwar exists not in the public eye but in the shadows -- that's imperative to grapple and understand. Think about how traditional war is conducted, promoted, and sold. Goosestepping Nazis, caricature-laden propaganda posters, showy tests of shiny new weapons: war is as much about optics as it is about tactics. Every conflict needs to be sold to an audience. This is usually done with visuals, examples being war bond posters, editorials with rhetorical images, and well-orchestrated photo-ops. Each of these visualizes war -- makes it palpable, not just an abstraction. More importantly, they visualize war to suit the whims of those who employ the images. As Umberto Eco once said, "today a country belongs to the person who controls communications." So then, how do you prepare for an invisible war? Can you no longer rely on the same images from before? We're in uncharted waters, writes Lee. There is no precedent for journalists covering cyberwars. There's also no precedent for governments to even need to sell a cyberwar. Most vital is that the fog of war has never been thicker than what exists in cyberspace. "Cyber-attacks occur in a manner that is unverifiable," says Lee, "often leaving its perpetrators unaccountable." Rasmussen: "Back in 2007 in Estonia was attacked through cyberspace and it caused a lot of damage. This is the reason why we [NATO] have decided to strengthen our cyber defense because future warfare will increasingly be carried out through our information and communication channels." The reason for this, says Rasmussen, is that we've developed a world economy that is increasingly dependent on information and communication technologies. Damage the systems upon which the world economy is built and you open the door to the eventual dismantling of society itself. A group of hackers, likely out of North Korea but still not conclusively identified, managed to bring an entire movie studio to its knees last month. Imagine that on a grander scale and you're looking at the definition of systemic risk. Rasmussen: "You might very well see in the future that the first wave of attacks against a country would be cyber-attacks because a cyber-attack can also damage conventional defense capabilities. It can have a severe negative impact on your energy supply, on financial transactions. And this is a reason why I think cybersecurity should have more and more attention and the reason why NATO decided at the recent summit that cybersecurity will be part of our collective security which means that if a NATO ally is attacked then other allies will assist that ally to defend itself against cyber-attacks." There's a real possibility that we wouldn't realize the first shot of a major cyberwar had occurred until our systems had already failed us. If we believe the old adage that the best offense is a strong defense, then the strongest possible play one can make is to prevent enemies from ever getting close enough to fire that shot. That's why, as Rasmussen says, the changing face of war necessitates the constant pursuit of robust cybersecurity innovations. When the enemy becomes invisible, your best strategy is to make yourself invincible, or get as close to it as you can.